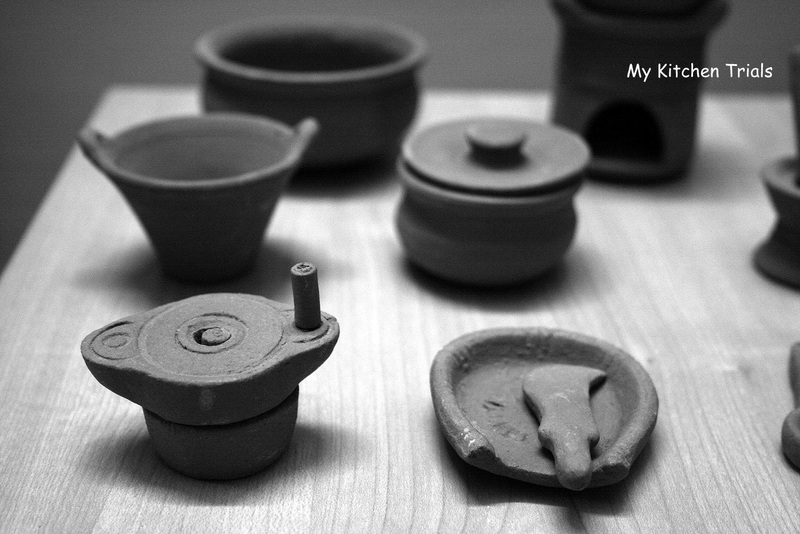 A black and white photo of the miniature utensil set, made out of clay, which I had bought long back. 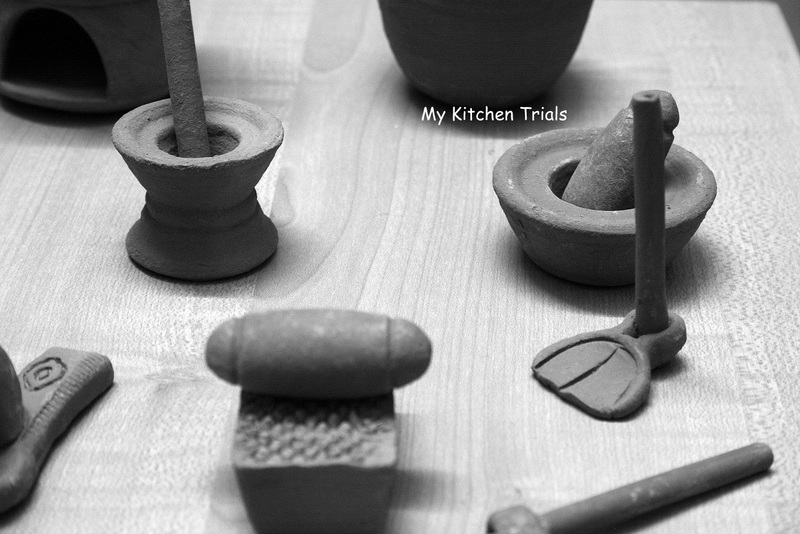 This set has a lot of utensils, which formed a part of daily life in the olden days. 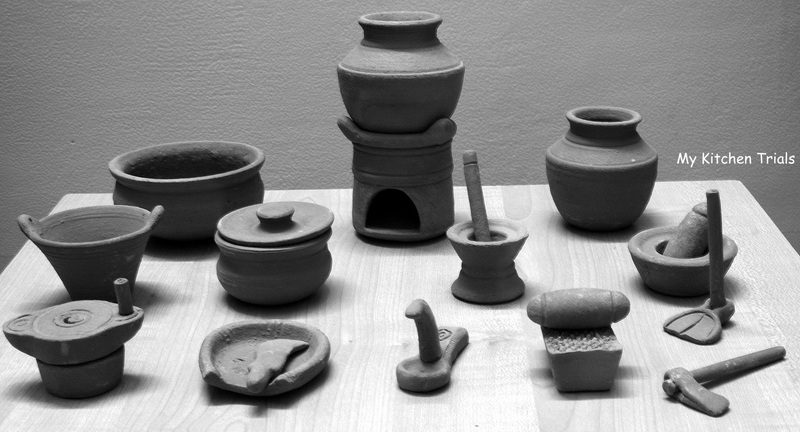 The clay stove, stone grinders (ammi, ural, chakki, attu kallu), a knife with seat attached (arimamana) are among the things which were used extensively till even about 20 years back. Now they are all near oblivion since everyone has moved towards electrical grinders. I bought this set from DakshinaChitra, a heritage living museum in ECR, Chennai. Its a beautiful place to visit and I would strongly recommend it if you are visiting Chennai. When you look at these things, they bring back a wave of nostalgia. For me, these things remind me of my granny. Many a times I have sat with her, while she was grinding dosa batter in the aattu kallu. Linked to Susan’s Black & White Wednesday. Simply amazing. Reminds me of the “Choppus” I used to buy in Sandhais to play with when I was a kid. Just beautiful, like a museum display. Thank you, Rajani, for your BWW Food image. I was googling for “aatu kallu” to show my daughter how this apparatus and i chanced upon ur pics. I loved the pics and the miniatures. Do you remember where u bought them? Hi, I bought these from DakshinaChitra in Chennai years back. It’s an open air living history museum. I bought this from Dakshin Chitra, a museum at Chennai.